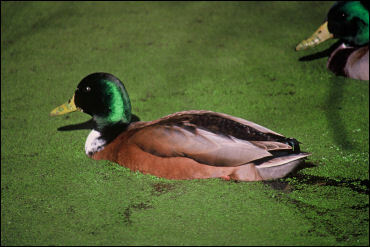 Anas is a huge genus whose presence implies only that some standing water, temporary or permanent, was in the vicinity. 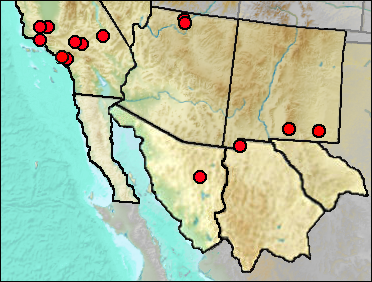 The species noted below occur today throughout watered parts of the region as wintering and/or breeding populations or in migration. None is important as an environmental marker and individual accounts are not given. Irvingtonian: El Golfo (Croxen et al. 2007: cf.). Rancholabrean: Pinto Basin (Jefferson 2014). Wisconsin: Costeau Pit (Jefferson 1991a). Mid Wisconsin: Blackwater Draw (Morgan and Lucas 2005). Mid/Late Wisconsin: Diamond Valley (Springer et al. 2009). Late Wisconsin: China Lake (Jefferson 1991a); Mountain View Country Club (Jefferson 2014: cf.). Late Wisconsin/Holocene: Balcony Room (Harris 1993c); Bat Cave (Scarbrough 1986). Literature. Croxen et al. 2007; Harris 1993c; Jefferson 1991a, 2014; Morgan and Lucas 2005; Scarbrough 1986; Springer et al. 2009. Wisconsin: White Lake (Harris 1993c; cf.). Late Wisconsin: Stalag 17 (Harris 1993c). Fig. 1. 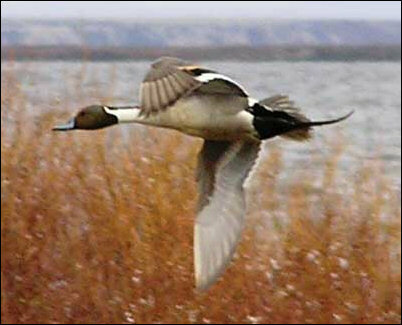 Northern Pintail in flight. Photograph courtesy of the USGS. ?Late Irvingtonian/Rancholabrean: Emery Borrow Pit (Jefferson 1991a). Mid Wisconsin: McKittrick (Jefferson 1991a); Térapa (Steadman and Mead 2010). Mid/Late Wisconsin/Holocene: Jimenez Cave (Messing 1986). Mid Wisconsin-Holocene: Shelter Cave (Howard and Miller 1933). Mid/Late Wisconsin: Dark Canyon Cave (Howard 1971). Late Wisconsin/Holocene: Howell's Ridge Cave (Howard 1962: cf. ); Stanton's Cave (Rea and Hargrave 1984). Literature. Howard and Miller 1933; Howard 1962, 1963, 1971; Jefferson 1991a; Messing 1986; Rea and Hargrave 1984; Steadman and Mead 2010. Fig. 1. 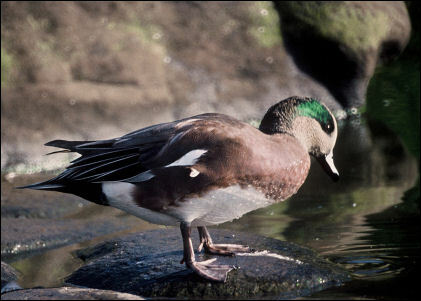 American Wigeon. Photograph by Lee Karney, U.S. Fish and Wildlife Service. Rancholabrean: Tule Springs (Springer et al. 2005). Sangamon: San Pedro Lumber Co. (Jefferson 1991a). Mid Wisconsin: McKittrick (Jefferson 1991a). Mid/Late Wisconsin: Sandblast Cave (Emslie 1988). Late Wisconsin: Skull Cave (Emslie 1988). 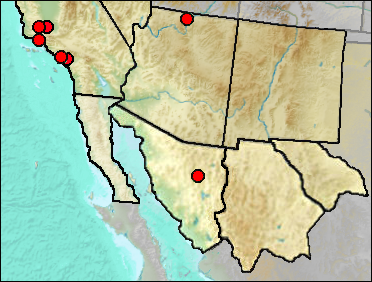 Late Wisconsin/Holocene: Stanton's Cave (Rea and Hargrave 1984); Schuiling Cave (Jefferson 1991a: cf.). Literature. Emslie 1988; Guthrie 2009; Harris 1993c; Jefferson 1991a; Rea and Hargrave 1984; Springer et al. 2005. Fig. 1. 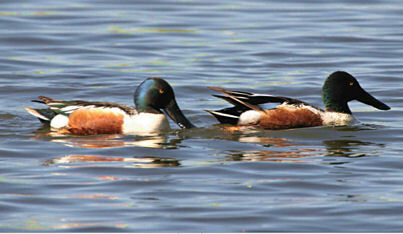 Male Northern Shovelers. Photograph courtesy of the US Fish & Wildlife Service. Shovelers are found throughout our region where suitable habitat is present. Late Blancan/Irvingtonian: Vallecito Creek, Anza-Borrego Desert (Howard 1963). Late Pleistocene: Rancho del Oro (Jefferson 2014). Mid/Late Wisconsin: Rancho La Brea (Stock and Harris 1992). Late Wisconsin: Skylight Cave (Emslie 1988). Literature. Emslie 1988; Howard 1963; Jefferson 1991a; Steadman and Mead 2010; Stock and Harris 1992. Fig. 1. 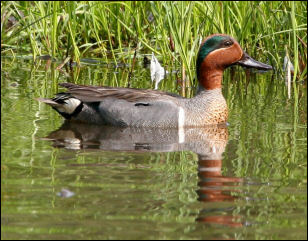 Male green-winged Teal. Photograph by Donna Dewhurst, U.S. Fish and Wildlife Service photograph. Irvingtonian/Rancholabrean: Manix Lake (Jefferson 1991a). Sangamon: La Brisca (Van Devender et al. 1985: cf. ); San Pedro Lumber Co. (Jefferson 1991a). Mid/Late Wisconsin/Holocene: Jimenez Cave (Messing 1986: cf. ); Rancho La Brea (Stock and Harris 1991). Mid/Late Wisconsin: Dark Canyon Cave (Howard 1971: ? ); Sandblast Cave (Emslie 1988). Late Wisconsin: Maricopa (Jefferson 1991a); Skull Cave (Emslie 1988). Late Wisconsin/Holocene: Howell's Ridge Cave (Howard 1962: cf. ); Schuiling Cave (Jeffeson 1991a: cf. ); Stanton's Cave (Rea and Hargrave (1984). Literature. Emslie 1988; Guthrie 2009; Howard and Miller 1933; Howard 1962, 1971; Jefferson 1991a; Messing 1986; Rea and Hargrave 1984; Steadman and Mead 2010; Stock and Harris 1992; Van Devender et al. 1985. Fig. 1. 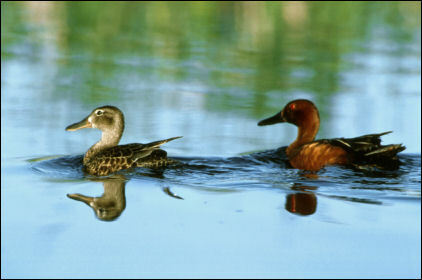 A pair of Cinnamon Teal. Photograph by Dave Menke, U.S. Fish and Wildlife Service photograph. Mid/Late Wisconsin: Rancho La Brea (Stock and Harris 1991: ? ); U-Bar Cave (Harris 1993c: ? ; possibly Late Wisconsin). Late Wisconsin: Animal Fair 18-20 ka (Harris 1989: ?). Late Wisconsin/Holocene: Stanton's Cave (Rea and Hargrave 1984). Literature. Harris 1989, 1993c; Jefferson 1991a; Rea and Hargrave 1984; Stock and Harris 1992. Mid Wisconsin: Térapa (Steadman and Mead 2010). Fig. 1. 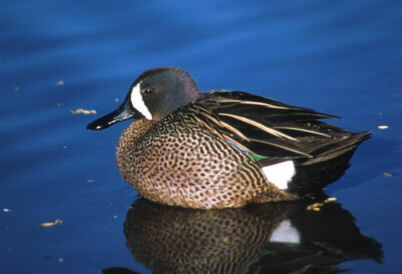 Blue-winged Teal. Photograph by Dave Menke, U.S. Fish and Wildlife Service photograph. Late Wisconsin: Stalag 17 (Harris 1993c; ?). Literature. Harris 1993c; Rea and Hargrave 1984. Because of the difficulty in distinguishing these two species by osteological criteria, they are merged here. 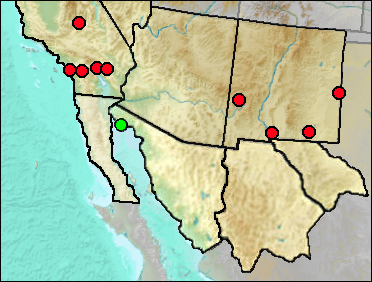 The current distribution of the Mexican Duck includes southwestern US and northern Mexico. Fig. 1. Male Mallard. Photograph by Lee Karney, U.S. Fish and Wildlife Service photograph. Irvingtonian/Rancholabrean: Manix Lake (Jefferson 1991a: cf.). Rancholabrean: Salt Springs (Jefferson 1991a); San Pedro Lumber Yard (Jefferson 1991a). Mid Wisconsin: McKittrick (Jefferson 1991a); Térapa (Steadman and Mead 2010); U-Bar Cave (Harris 1987: cf.). Mid/Late Wisconsin: Dark Canyon Cave (Howard 1971); Rancho La Brea (Stock and Harris 1992). Late Wisconsin: Maricopa (Jefferson 1991a); Skull Cave (Emslie 1988); U-Bar Cave 14-15 ka (Harris 1989: cf.). Late Wisconsin/Holocene: Pendejo Cave (Harris 2003: cf. ); Schuiling Cave (Jefferson 1991a: cf. ); Stanton's Cave (Rea and Hargrave 1984). Fig. 2. 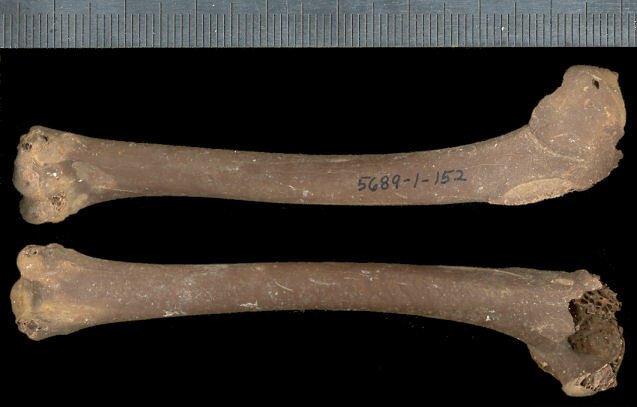 Left humerus of Anas cf. platyrhynchos from U-Bar Cave. Literature. Emslie 1988; Guthrie 2009; Howard 1971; Harris 1987, 1989, 2003; Jefferson 1991a; Rea and Hargrave 1984; Steadman and Mead 2010; Stock and Harris 1992. Fig. 1. Gadwall. U.S. Fish & Wildlife Service photograph. 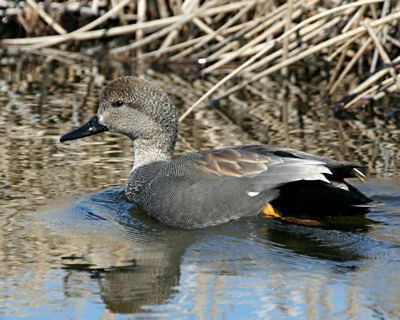 The Gadwall occurs throughout most of our region. Mid Wisconsin: Mid Wisconsin: McKittrick (Jefferson 1991a); Térapa (Steadman and Mead 2010). Late Wisconsin: Maricopa (Jefferson 1991a). Literature. Guthrie 2009; Jefferson 1991a; Rea and Hargrave 1984; Steadman and Mead 2010; Stock and Harris 1992.